It all began almost a full half century ago, actually in Buffalo, New York as Dad made a modest beginning in doing what he liked best… assembling the most unique furnishings and fixtures to be found along with antiques without equal! As times and circumstances changed, we found ourselves in the Atlanta area, and subsequently in Florida, where what we are has been an important addition to the landscape…and we’ve been here ever since. 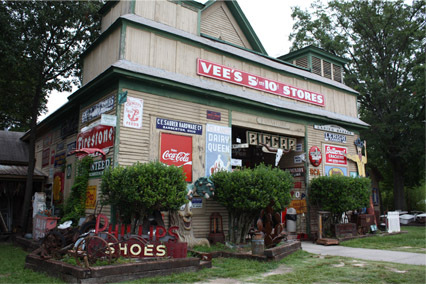 The business has evolved, from a simple antique and collectibles store into a facility that houses millions of items that are used for props in local tv, stage, and movie productions. It’s an exercise in pure delight, as we continue Dad’s uncompromising tradition and heritage, with our collection of fine Americana, unequalled in the entire country. Walk through the doors of our warehouse and you'll see. It’s no wonder (or happenstance) that we’ve been selected, time and again, to provide that same sense of what we do best, with the renting of props in the new Atlanta movie industry market. It excites us to know that what we provide helps bring enjoyment to the world through movies and tv in the entertainment industry. We’re THE singular source where all the great nostalgia stuff comes from! From concept development to providing all the props and important details, you’ll want to contact or visit us soon. Click on any of the bellow images for a larger view.